Bill Windsor's Trial Preparation Filing System is destined to be Patented. 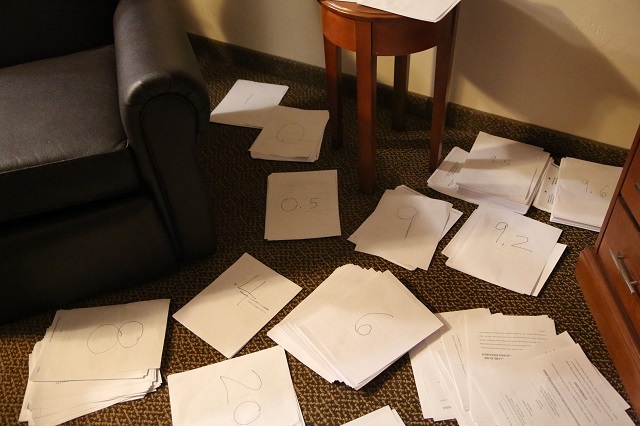 The system involves using every square foot of floor space to organize documents. As long as you have enough floor, it works like a champ. 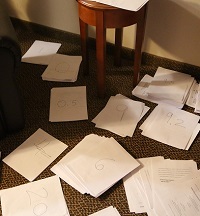 In this particular application, I am numbering classifications of exhibits prior to organizing them in the order in which I plan to introduce them. I will then apply individual exhibit stickers. Four copies and hundreds of dollars later in tab dividers and notebooks, I will once again be ready again. This would not be so difficult, and would not have been done a half dozen times so far, if Judge James A. Haynes would allow me to present my defense. He won't, so I keep whittling away. I pray that I will get finished with this today. I am so tired of screwing around with all the evidence that I have that I am ready to be done with it! My criminal trial is January 5-6, 2016 at the Missoula County Courthouse in Missoula Montana. There will be giant blow-ups of key exhibits, a video or two, some audio recordings, and witnesses who also received threats from Sean B**shie, one of the villains in the case. I hope to have six (6) other victims there to testify. I plan to call the judge and the prosecutor as witnesses. That should be fun. There will be autographed full-color Wanted Posters for all who attend, so please join us. Thanksgiving was fabulous as Texas Tech beat the University of Texas! I did not venture out in search of turkey. I had leftover pizza and other nutritional goodies.